Discussion in 'Downhill & Freeride' started by DH Dad, Nov 13, 2012. Lots of threads on kids dh bikes but haven't found too many on tweener frames. My sons finally outgrown his gromrock and ready for something with 26" wheels and rear suspension. Since he's been tearing up Highland for 2 years on a 24" HT he doesn't need a ton of rear suspension and tt should be very short. Should I be looking at small SS frames like a wildcard or double? I don't know that either of those would be at the top of my list. The suspension on the double is on the stiff side and the small wildcard isn't that small. It would be a good choice otherwise. You might look for a used women's bike if you really want a short top tube. 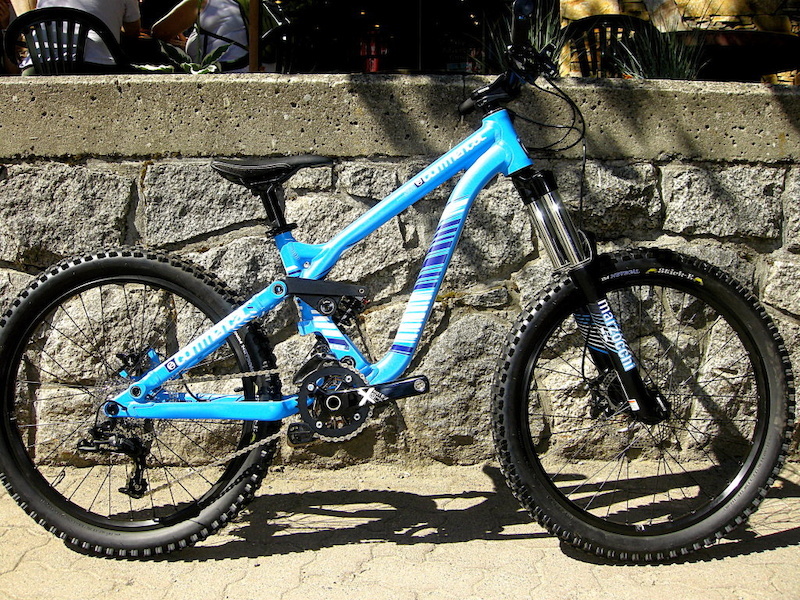 Both the Transition Syren and Norco Minxy are pretty cool bikes if you can find a good one. I would probably get something used and get more of a park bike than an SS bike unless the kid just wants to jump. A small Canfield Can Can or Can Diggle would be pretty ideal. how much can you spend? You could always go custom. For a kid who will outgrow it in a couple of years I'm not going custom. Hoping to find a used small FS frame. The kid is always jumping, type of kid if I brought to Whistler would spend the whole day on A-Line. I don't think he'd like a lot of suspension, he's always closing the floodgate on his RS fork so it doesn't dive when he's popping off of stuff. Maybe the Double is the right choice for him. XS Demo frame with a Single crown fork? I know that's a lot of travel and isn't the best geometry for jumping but its a proven frame, pretty readily available (maybe not the xs? ), and it would be a great frame if he ever progresses to more "DH" style trails and riding. I think Kona also makes some pretty small frames, and they are geared moar towards freeride. Transition Syren is pretty small to, you'll have to trick your kid and tell him the pretty flowers on the frame are Gnarly Freeride Flowers! I hate to spam, but I'll have my 15" IH 6-point up for sale in the next few weeks. It's got 160mm travel front and rear with a nice, short TT. This kind of bike would probably work really well for your son at Highland as a park bike. Send me a PM if you might be interested. If you think the Double is what he'd like, you might also look for used SX supercross or Blur 4x. They are both super versatile and fun bikes. 12 and 57", probably close to 5' by the time the 2014 season rolls around. Does Transition even make the Syren anymore? There's a few on Pinkbike for sale but mostly in Canada or state of Washington. I'd love to get him a XS Demo but that would be more what I'm interested in than him since I'm not good at riding the new park/TT style DH runs. My DH background is more gnarly steep natural terrain at places like Sunday River, Mt Snow and Bromont. I think he'd probably hate a Demo if I got him that. Just read about the Black Market Killswitch, may be right up his alley. Can get it with a 21" TT and very short chainstay. About the same price as a Double. I'm thinking you get him a $200 Haro pump track bike and the Demo. If he hates it, consider a paternity test and or stripping the parts off it as back up for you and wait til he comes around. I blame it on his Mom, she's also gravitated to the new school super buffed out DH runs. If I take either of them on a real DH trail, you know the kind with roots/rocks/mud, they both complain the whole way down. Either way I still get to DH since they go to the resorts with me and in between their runs when they take a brake I get to ride the stuff I like. I'm going to consider the Banshee Rampant as well, similar category to the Double and Killswitch but a lot lighter. Specs show a longer TT measurement but a shorter Reach measurement which is more important when looking at frames for DH/DJ use. rampant will be a winner for sure. It just punches way above its class in terms of versatility. 26" wheels. Highland is my home mtn. and my thoughts were that he could use it as a low travel DH ride and as he grew and could fit a real DH bike, he could use it as a DJ/SS bike. Kidwoo did a review on the bike and I put a lot of faith in what he says (search specialized sx review on blistergear) . I think it would be the perfect bike for Highland and a kid, that isn't looking for a ton of travel, and spends a lot of time in the air. Go to the shop and ask for Chad to see if you can check his out, he's one of the coaches there and rides the short (they only come in short and long). If youy ask nice, I bet he may even let him take a spin on it...although tomorrow would be the last chance for that. I found a few on pink bike...one of which was in like new condition for around 16-1800 fully built. Good luck. Is this the frame you're referring to? If so the TT is almost 23", Reach is 16.7" and WB is almost 44". Standover is the only number that looks good, seems way too long for a kid, heck the reach and WB on my bike isn't that long. By comparison the Double has a 21.5" TT, 15.4" reach and a 41.6" WB. You must be looking at the Long. The short has a 21.8" top tube. But impressive that the Double has a shorter reach and CS. Have to be short since im on mobile but here is what i think. Sx is awesome. I own one and i love it. Takes a beating. Additionally he can keep that forever. One of my favorite bikes of all time. Period. I did own a Killswitch at one point I hated it and the suspension is mostly therefore looks it does not right well and absolutely would not do any sort of bump absorption at all. I owned one in a 23 inch and the bike might have been the biggest bike I have ever owned traditionally I ride a large this thing was enormous. My personal vote would be for a small six-point or a small Kona stinky. The stinking may even come and 24's. I think a more versatile downhill style bike will be better for him he may love to jump but everybody can jump a small dh just fine they don't weigh much more anyway. How about a small Canfield Can Diggle? I know somebody selling one. I still think that would be an awesome bike for a small DH ripper. I plonked my lad on a Bottlerocket, first with 150mm fork and a 7.5x2 shock, then a 170mm fork, 2 degree headset cups and a 7.875x2.25 shock. He is now on a Medium Kona Entourage. Small Kona Entourages and Scott Voltages are ripping up the u13 and u15 class in our club. I think the biggest thing to help you decide is chainstay length, a small bike needs to be short in the back end or they cant turn them. Commencal make som serious toys for the kids! Thanks, all good points but I don't picture him ever getting into the DH race scene. He's a nationally ranked freestyle skier for Slopestyle and Halfpipe and has never had an ounce of interest in ski racing. He did one ski-cross race last year and did well but had no interest in doing it again. When he was 8 he bmx raced and won several races but had no interest in continuing with it. Last summer we went to the world cup at Windham and after 4 or 5 pro riders he lost interest and went down to jump off the platform into the airbag. Seems racing isn't in his blood and he prefers being in the air. I'm leaning toward the Transition Double or Banshee Rampant at this point. He said 57" or 4'9".